So my cousin Foo has her own blog where she posts about meal plans, various recipes, and how they turned out. 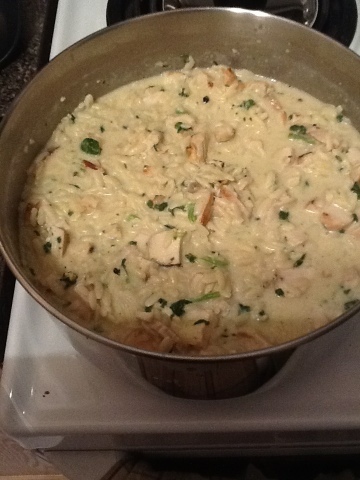 This past week she posted a meal plan that included a recipe for Chicken Cajun Ranch Pasta. I liked the sound of it and have been looking for some new chicken recipes to use on a regular basis. As usual I changed things to fit what I had on hand and prefer. The words struck out are what I didn't use and the words in bold are the additions or changes. The recipe also asked you to pound the chicken ahead of time. But my daughter was sleeping so just pressed them out with a rolling pin. Then I put it in a Tupperware container and put it in the fridge overnight. While my daughter was sleeping I cooked the chicken in a George Foreman grill cuz it's freaking freezing outside (-20 C with the windchill) and I liked the charred effect I saw that you can really get in a pan. Then I put them in Tupperware in the fridge until later. 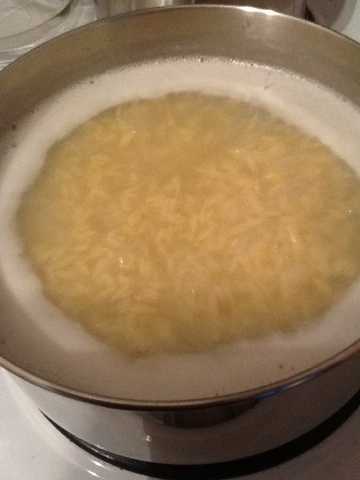 I cooked the orzo until it was nice & fat. I strained it put it back in the pot and added the sauce. It was still REALLY soupy. So I put it on medium-low and stirred while I chopped and mixed in the chicken into small bite-sized portions (my daughter is only 19 months). 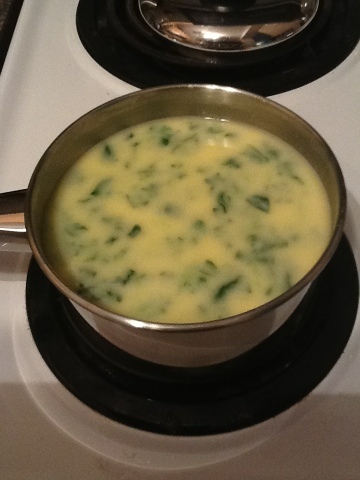 Then I put turned off the burner, put on the lid, and let it sit for about 10 minutes until it had thickened. Overall I liked the recipe and I'm going to add it to my go to list. Though I think it will have to wait until the summer when I can do it on the barbecue (using a tiny little George Foreman was not fun). It also takes some prep work. So I'll have to plan ahead to put in rotation. So it'll prolly be for Saturdays. I'll knock out the salt & ground pepper and use just Cajun seasoning and Sriacha sauce instead. 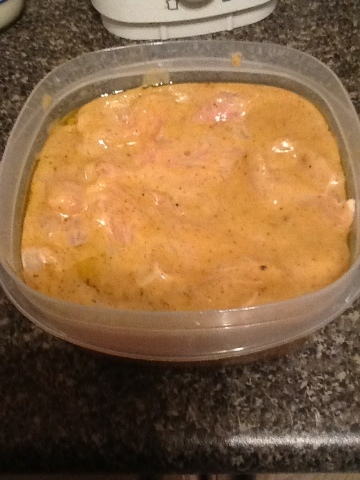 For the marinade I'm going to try brown sugar instead of white. Switch out the Parmesan cheese for mozzarella or ricotta cheese. Duffman, I didn't know you cook too! You're going to fit perfectly at CacheCrazy. There are several of us who love to cook, ha! Looks like great eats!